James Cain, managing director of Harrogate Spring Water, alongside their shrinking bottles making it easier to recycle. When Bettys & Taylors bans plastic straws from all its café tea rooms, it’s obvious the times are, indeed, changing. Known for its tradition and high standards, this award-winning Harrogate company has also long been recognised for its ethical and environmentally-friendly approach. Its strong commitment to balancing environmental considerations with the need to keep its products well protected and in good condition means it’s never slow to pick up on new concerns and react with new solutions. Hence its recent decision to switch to paper straws. But Bettys & Taylors is not the only business in the district taking additional steps in the growing war on plastic waste. More and more bars, cafes and restaurants in town are joining in, too. The new buzz word is “reusable”, the idea to cut down on landfill by making plastic straws and single-use paper cups a thing of the past. It’s a word now being mentioned regularly at local places including Balzersens, Revolucion de Cuba, The Fat Badger, Cedar Court Hotel, Bean & Bud, Rafi’s Spice Box, Bites Café and Cold Bath Road Deli. For ideas which were at best ‘fringe’ only a few years ago, it’s been a remarkable transformation, triggered, perhaps, by Sir David Attenborough’s influential BBC series Blue Planet II. Within a few months of its broadcast late last year, more than 40 top British-based companies had signed up to the new UK Plastic Pact with a rigorous list of pledges to reduce plastic packaging in a seven-year time table. That the local landscape in the Harrogate area is also changing fast is reflected by the appearance of new local pressure groups. Politically-neutral, their knowledgable members are happy to collaborate with businesses, local government officers and politicians of all persuasions. 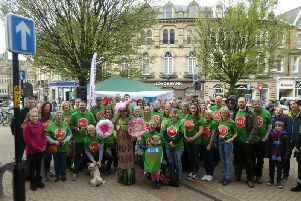 Aina Maj Landvik of Plastic Free Harrogate says Harrogate businesses are leading the way when it comes to plastic waste. She said: “Businesses in Harrogate are doing a lot to reduce plastics. Smaller independents, in particular, are allowing their customers to bring their own containers. Jemima Parker, chair of pressure group Zero Carbon Harrogate says the basic problem about non-biodegradable plastic goes well beyond the fossil fuels and carbon emissions involved in its production. If any Harrogate business understands the plastic waste issue it’s Harrogate Spring Water, one of the town’s most famous brands internationally. From the beginning, its management team of James and Nicky Cain, managing director and marketing director respectively, have been keen the company should be a national leader in reducing waste. Its Harlow Hill base boasts one of the most technologically-advanced and environmentally-efficient facilities on the planet. Such is its record of environmental stewardship, it boasts that it is “zero-waste-to-landfill” ie all of its products and materials are 100% recyclable. But the inter-connected nature of the modern world means things may not always be as straightforward as they seem. As a business dependent on bottles, Harrogate Spring Water says plastic itself is not the enemy, it’s what type of plastic and what happens to it afterwards. This month will see the company fulfil its own pledge to switch a total of 50 per cent of all its products to PET plastic, a material which is 100 per cent recyclable and crushes easily even in a human hand. And it has also launched a “twist it, cap it, recycle it” campaign recently aimed at customers who buy its bottled water in plastic bottles. Nicky Cain said: “It’s all about consumer education. For example, it’s an old wives’ tale that the cap to a plastic bottle can’t be recycled. It can. James Cain argues it’s not the bottle which is the problem at all, it’s the lack of joined-up-thinking when it comes to recycling facilities in the United Kingdom. He said: “Right now there’s only the capacity in the UK to recycle 41 per cent of all plastic bottles compared to 105 per cent in Spain, for example. “Street collections are great when it comes to recycling but only 41 per cent of water drinkers recycle bottles on the go and that’s because of the lack of recycling bins for public use in the streets and at shops and garages.